The Life Sciences Institute at the University of Michigan will be a 235,000 gross square foot facility consisting of six floors and a mechanical penthouse. It is one of a complex of buildings proposed as the Palmer Drive Development. The facility is designed to accommodate the newly created Life Sciences Institute, whose purpose is to enhance the education, basic research and translational research in the life sciences at the University. The proposed facility will consists of approximately 150,000 net square feet of space, housing “wet” research laboratory and laboratory support spaces, core laboratory areas, principal investigator offices, interaction spaces, the Institute’s administration offices, a combined gallery/lobby space and a small library. Along with the research building, the institute staff will have the ability to use complementary facilities at other buildings on the site including: computational laboratories – “dry labs”, conference and meeting facilities, a lecture space (140 seat capacity) and food service facilities. 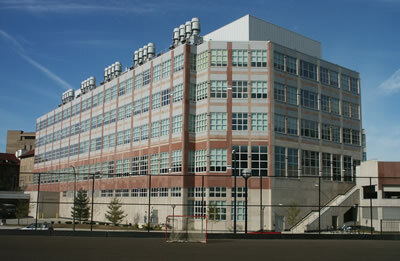 The exterior of the building is to blend respect for the traditional central campus loft style buildings of the early 20th century and the needs of a 21st century research facility. The material palette will consist largely of stone, including brownstone, sandstone, limestone and granite, with painted aluminum frame windows.